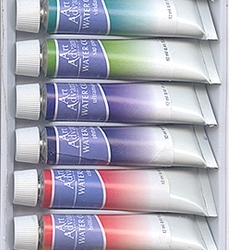 Art Advantage 12 Color Artist Watercolor Set - Art Advantage Watercolor Paint Sets - Perfect size for trying a new medium or as a travel set. All Art Advantage paint sets offer good lightfastness and covering power. Good transparency permits the white reflective surface of watercolor paper to shine through. Perfect for capturing the illusion of atmosphere, space and light. 12ml.